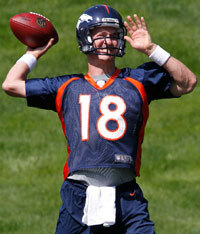 Published: July 26, 2012 at 11:44 a.m.
Peyton Manning had his first Denver Broncos training camp practice Thursday. The biggest crowd in Broncos training camp history welcomed Peyton Manning to Denver on Thursday. The 4,371 fans in attendance, a Broncos training camp record, erupted like it was Week 1 when Manning jogged on the field. Manning says he's gotten past being "nostalgic" for his days with the Indianapolis Colts and likes being around this Broncos group. "I love being around young players, but they're all young compared to me," Manning said. "It's humbling sometimes when they tell you they enjoy watching you on ESPN Classic. But it's fun being around these guys." Really, the video above says more than anything we could write. So enjoy. This is the story of the NFL in the coming weeks and months. We would like to thank the Football Gods once again for training camp finally being here.